The Professional Landcare Network (PLANET) Day of Service took place April 22. This year’s theme was Come Alive Outside to showcase the positive effects green spaces have on peoples’ lives. The program, which coincides with Earth Day, is designed to encourage landscape and lawn care companies to give back to their communities. PLANET provides tools to help them successfully plan, organize and carry out projects that benefit the green spaces in their communities. Hundreds of volunteer landscape projects take place each year at schools, community parks, military memorials, libraries, and museums across the country. Following are a few of the PLANET Day of Service and Earth Day events that have taken place so far. Heads Up Landscape Contractors, Albuquerque, N.M., teamed up with FED EX to perform landscape cleanup and spruce up work at the Ronald McDonald House Charities of New Mexico. The Heads Up employees volunteered their time during the day to prepare the landscape for spring by removing dead plant material, pruning, checking irrigation, pulling weeds, raking rock. The company’s donation of time, equipment and hauling away landscape debris is estimated to be $2,000. STIHL Inc., Virginia Beach, Va., has participated in PLANET Day of Service events for the past four years, volunteering more than 1,400 hours and saving the city more than $60,000 to make city parks more beautiful with plantings, pruning and gardening projects. 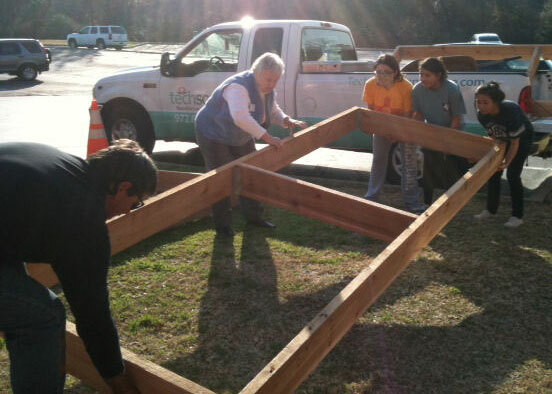 Horticulturists from TechScape Landscape, Richardson, Texas, built three raised garden beds for the Ursuline Academy Permaculture Awareness Club, which teaches students the importance of eating organic food. The company provided training, tools, and supplies to the students. Their first year of planting was so successful, they donated their surplus vegetables and herbs to charity, a goal they did not expect to reach so quickly. Associated Landscape Contractors of Colorado overhauled the Alpine Autism Center’s property as part of its Earth Day project. They worked on the property to increase curb appeal and comply with the state’s new watering regulations. They removed the non-useable turf and replaced it with mulch, rock, and other products that require less water. Landscape Management Senior Editor Beth Geraci tagged along as Chagrin Falls, Ohio-based Hemlock Landscapes donated staff, time and materials to spruce up the grounds of the Ohio Army National Guard’s 135th Military Police Co.